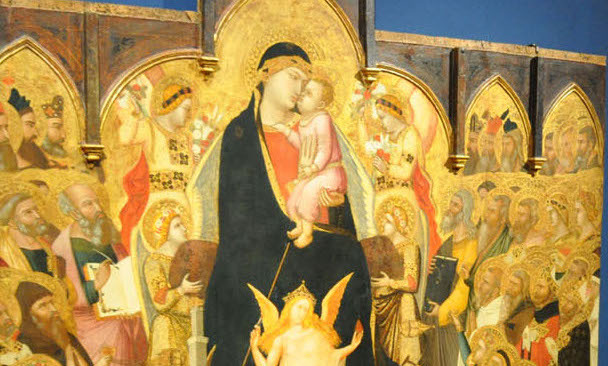 Until November 4: AMBROGIO LORENZETTI IN MAREMMA. THE MASTERPIECES OF THE TERRITORIES OF GROSSETO & SIENA. Complesso Museale di San Pietro all’Orto, Massa Marittima. Open 10 am – 1 pm, 4 – 7 pm, closed Monday. Admission €7, reduced €5. Almost 700 year ago, in the scenic town of Massa Marittima, the artist Ambrogio Lorenzetti painted his masterpiece “Maestà” (Majesty) for the Augustinian monks of the town’s Church of San Pietro Orto. The lustrous polyptych features the Madonna and Christ Child seated on their heavenly throne, surrounded by angels and allegorical characters. The figures are illuminated by painted golden filigree haloes. This piece is one of 11 included in Complesso Museale exhibition. The show features videos and multimedia presentations that aim to provide Lorenzetti’s displayed works with historical context. Among the exhibits is a fragment from a fresco originally located in the Capitular Room in the Sienese convent of San Francesco. Painted by Ambrogio and his brother Pietro around 1320/1325, the fragment portrays King Solomon. The figures seem to have been rendered in marble rather than paint: Madonna col Bambino e i Santi Cecilia, Pietro, Paolo e Michele Arcangelo gaze upwards, cloaked in a sea-foam blue robe, her alabaster cheek flush with a rosy hue. In this, as in other Lorenzetti works, the subjects are paradoxically both otherworldly and unmistakably human. Their skin is impossibly smooth, glinting eyes highlighted by the surrounding gold, and their hair plaited without a strand out of place. Though Lorenzetti’s depictions are scrubbed of imperfections, the countenances of his subjects are infused with great pathos: a difficult feat. He is in fact a master of balance: heavy wood panels whose paintings are ethereal, featuring saints with soft expressions and busy scenes that possess harmonious composition. Lorenzetti paints with the colors of a blazing sunset over a Tuscan landscape, with metallic gold, cardinal red, blood burgundy, petal pink, jade green, midnight blue and cream. The skin of his figures seems to glow against the painted gold and rich overall tonality. Though the works are beautiful from afar, the details are perhaps more exquisite. Halos are dotted with raised golden patterns, greying beards are patterned with undulating curls, and geese peek out from behind brocaded robes in a crowd.